So maybe you have or have not heard about tiles within the context of video games. For those of you who have, great, tread onwards into the more advanced areas of the article. But to those of you who have not, take some time to let the information below soak in. I strongly suggest that you spend time implementing and testing some solutions of your own in throwaway projects just to see the results in real time and for yourself. Many people are hands on learners and doing a lot of the experimentation yourself goes a long way to understanding the concepts. I plan to make a few articles about various topics in tiles, tile maps, rendering, and interacting. Part 1 will focus on the concepts behind two popular formats of tile maps and rendering techniques. Part 2 will delve more deeply into rendering isometric tile maps with an explanation of the differences between world space and screen space. Finally, in Part 3, I will discuss topics such as isometric tile picking and moving entities within an isometric tile space. Before all that though, let’s begin with the basics, shall we? Maps are often stored and displayed in equally sized tiles to make life easier on the renderer and the artists. It is usually easier to begin understanding a tile map in an oblique projection, which is one of the simplest (but very effective) forms of projecting your tiles. Many popular games from the 80s, 90s, and even 00s take advantage of this projection due to its relatively simple mathematics. 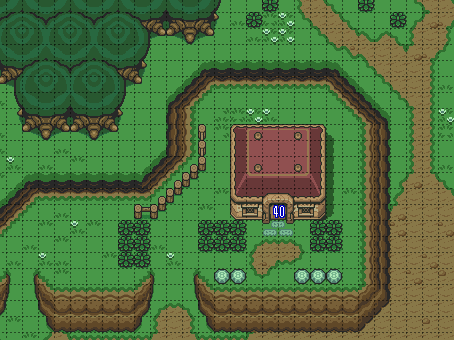 For example, in the Legend of Zelda on SNES, tiles were utilized to create structured maps with the ability to quickly re-use art assets and build customizable terrains. Notice how the bushes, rocks, fence posts, and walls can be evenly split into tiles of equal sizes? 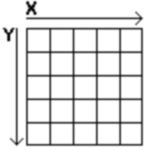 Can you see how this tile map could easily be stored in a data structure such as an array? Imagine storing a tile map in a two dimensional (or even one dimensional with some cleverness) array. 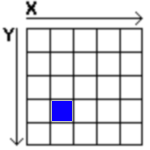 Each cell of the tile map represents one index into the array with the origin most commonly being [0, 0]. Since each tile has a specific width and height (usually equal, but does not have to be), it is quite simple to render this map by simply using multiplication. When I first started making my game, I hard coded the screen resolution to 800 x 600 for simplicity and built my menus and levels with the assumption that the screen was exactly 800 pixels wide and 600 pixels high. This was a mistake because all of my UI positions, tile positions, and entity placements were based on absolute positions and did not look proper when the resolution changed. If the user wanted to use a screen size that was not 4:3 and super tiny, the game looked completely wrong and was unplayable because the level layout was all over the place. To solve this, I used David Amador’s Resolution class to introduce a means of rendering my scenes independent of the actual resolution of the window. I maintained an “internal” or “virtual” resolution of 1280 x 720 (Xbox standard) to be used for position of all my entities and UI elements. This virtual resolution never changes. Users can then adjust the “actual” resolution of the game which determines the real window size. We use a scaling matrix to transform the virtual resolution to fill the actual resolution with additional letterboxes or pillarboxes depending on the virtual and actual resolutions. I suggest you read the linked article from David Amador to understand the class and how to use it. Obviously, your needs will dictate the exact parameters, but this is the overload you need to use at the very basic level. Another problem you’ll run into is when trying to use mouse coordinates to interact with the elements of your game. The transformation matrix is applied only to the sprite rendering and does not affect the state of the mouse cursor. For example, using a straight up MouseState.GetState() will return coordinates in terms of the actual resolution and not the virtual resolution. Since your game is working in terms of the virtual resolution, this behavior is wrong! Luckily, one of the commentors in David’s article explained a way to transform mouse coordinates into the virtual screen space. Here is a simple static abstraction that I created to get mouse position in terms of virtual resolution. First, add two static members to the Resolution class. Second, assign values in the ResetViewport() method. One of the large distinctions between video games and other forms of entertainment is the ability for the user to provide input to directly affect the state of the system. In essence, the user is driving the medium and has direct leverage over the future of their character(s) within the rules of the system. This uniqueness places a large burden on the designers to provide a good system of input for the users. Such a system can be the difference between maintaining loyal users and being completed ignored or negatively criticized. On the PC, the mouse and keyboard are kings. There are other ways of controlling your computer through touch interfaces, headsets, speech, and USB controllers, but the majority of the time is spent using a mouse and keyboard. In my personal opinion two of the largest sins regarding mouse input is the application of mouse acceleration and the occurrence of “soupy” mouse movement. The former is a large point of debate and the latter is a consequence of bad design and possibly video settings.